This month’s word, suggested by Nim on Patreon, is Friendship. This seems a delightful way to start the new year – I hope we all have plenty of it. I encoded it in base seven and then found a way to make two layouts: one lace, and one chart for a variety of needlework. Thanks to my supporters on Patreon who help support my blog work! I like the way it looks as if there are moths (the nice kind) or butterflies in the pattern. cdd: slip 2 together as if to knit together; knit the third stitch, then pass the slipped stitches over. Here is a stitch map for this stitch pattern. And here is a printable PDF of the stitch map. Row 1 (RS): k1, yo, k2tog, k4, k2tog, yo, *yo, ssk, k4, ssk, yo, 1/1 RC, yo, k2tog, k4, k2tog, yo, work from *, yo, ssk, k4, ssk, yo, k1. Row 2 (WS): p8, k1, *p17, k1, work from *, p9. Row 3: (Yo, ssk) x 2, k2, k2tog, yo, k1, *k1, yo, ssk, k2, k2tog, yo, k2tog, yo x 2, ssk, yo, ssk, k2, k2tog, yo, k1, work from *, k1, yo, ssk, k2, (k2tog, yo) x 2. Row 4: p9, *p8, k1, p9, work from *, p9. Row 5: cdd, k4, yo x 2, k2, *k2, yo x 2, k4, cdd x 2, k4, yo x 2, k2, work from *, k2, yo x 2, k4, cdd. Row 6: p5, k1, p3, *p2, k1, p11, k1, p3, work from *, p2, k1, p6. Row 7: k1, ssk, cdd, yo x 3, k1, k2tog, yo, *yo, ssk, k1, yo x 3, cdd, k2tog, 1/1 RC, ssk, cdd, yo x 3, k1, k2tog, yo, work from *, yo, ssk, k1, yo x 3, cdd, k2tog, k1. Row 8: p4, k1, p3, k1, *p4, k1, p8, k1, p3, k1, work from *, p4, k1, p4. Row 9: k1, k2tog, k2, yo, k1, k2tog, yo, k1, *k1, yo, ssk, k1, yo, k2, ssk, k2, k2tog, k2, yo, k1, k2tog, yo, k1, work from *, k1, yo, ssk, k1, yo, k2, ssk, k1. Row 11: (K2tog, yo) x 2, k1, (yo, k2tog) x 2, *(ssk, yo) x 2, k1, (yo, ssk) x 2, (k2tog, yo) x 2, k1, (yo, k2tog) x 2, work from *, (ssk, yo) x 2, k1, (yo, ssk) x 2. Row 13: k1, yo, k2tog, k1, yo, k1, k2tog, yo, k2tog, *ssk, yo, ssk, k1, yo, k1, ssk, yo, 1/1 RC, yo, k2tog, k1, yo, k1, k2tog, yo, k2tog, work from *, ssk, yo, ssk, k1, yo, k1, ssk, yo, k1. 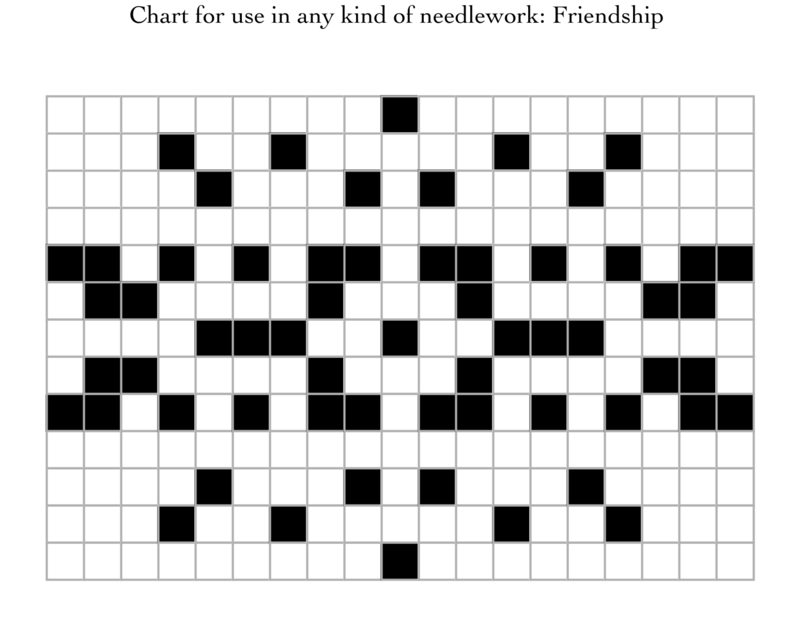 As promised, here’s a chart for a variety of needlework. It would be good for knit/purl patterns or some other kinds of textured knitting, but probably not for stranded knitting because of the long floats. Also good for cross stitch or beadwork or needlepoint or what-have-you. Friendship patterns by Naomi Parkhurst are licensed under a Creative Commons Attribution 4.0 International License. Oh!! It’s beautiful! What a wonderful way to start the new year. I’m glad you like it! I’m very pleased.